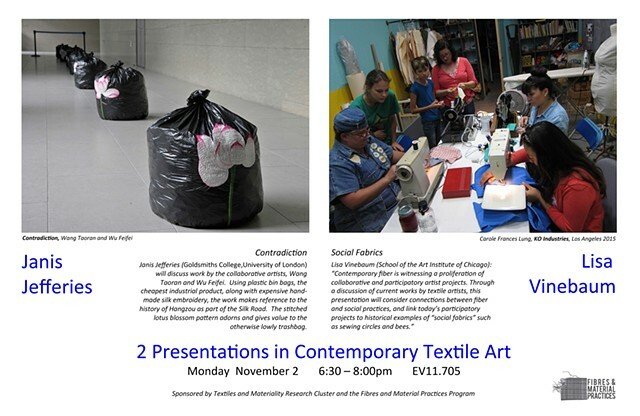 Fibers and Material Practices, in conjunction with the Textiles and Materiality Research Cluster. This lecture explored contemporary artist projects that span fiber and social practices, mobilizing collectivity and public participation to raise awareness about pressing social and to demand social change. These current projects also connect back to historical instances of collaboration in textiles, including sewing circles and quilting bees, organizing in the trade union movement, and community organizing for racial and socio-economic justice in the USA, Canada, Chile, Argentina, South Africa, and Mexico.